A housing partnership between Bolsover District Council and Robert Woodhead Ltd has been shortlisted for two top accolades at the Building Communities Awards 2017. 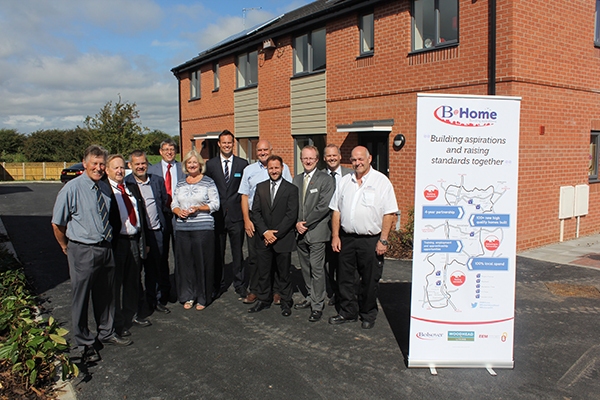 The B@Home Partnership was procured through Efficiency East Midlands (EEM) in 2015. That same year representatives from Robert Woodhead Ltd and Bolsover District Council signed a partnership agreement to deliver more than 100 high quality energy efficient homes, over a four year period, while maximising social and economic benefits. The project has been shortlisted in both the Project of the Year and Corporate Responsibility categories at the regional awards, which will be held at the East Midlands Conference Centre on Friday 24th February 2017. In August this year B@Home celebrated the completion of the first housing scheme at Rogers Avenue in Creswell, Derbyshire, and work is now well underway on a second site in Blackwell. A third development in Shirebrook has just started in the past few weeks. The programme of work was the first of its kind for Bolsover District Council and required a raft of collaborative planning workshops to kick start the scheme. To formalise the partnership an agreement charter was signed, which detailed the skills and training commitments and corporate responsibility standards required. Moving into its second year, the programme has already positively impacted the local community, offering 12 work experience opportunities to local students and engaging with more than 1,200 young people preparing for their careers through talks, mock interviews, and careers fairs. So far the project has successfully worked with subcontractors from the local area, with more than 60% being sourced from within a 20 mile radius. The Rogers Avenue site in Creswell also boasted the most local site manager Woodhead has ever had, with Bob Chadwick who lives just around the corner from the site! Bolsover District Council’s Cabinet Member for Housing, Councillor John Ritchie, said: “It’s fantastic news to be shortlisted for two prestigious awards such as these. We’re very proud of what we have achieved so far as a partnership, it was lovely this summer to see the new families moving into their brand new homes, and I can’t wait to see the next homes to be completed in Blackwell.